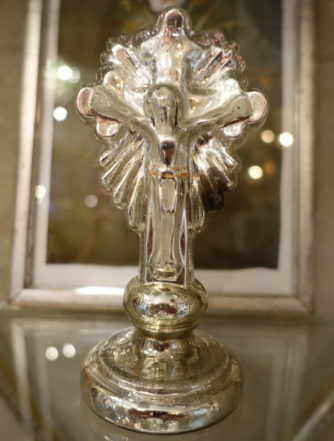 Our extensive collection of poor man’s silver includes exclusive finds, which give a personal unique touch to your home. 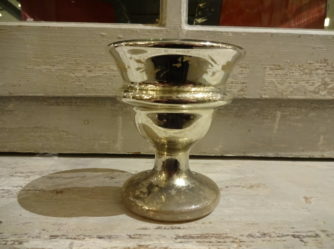 Poor man’s silver was initially created for ordinary people as a substitute for genuine silver ware. Nowadays of course they are collectors items in their own right, due to their gorgeous patina look and glow. 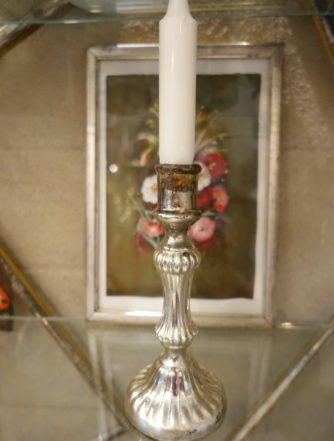 Discover our rare and lovely selection of lamps and candlesticks, each with a story to tell. The story behind poor man’s silver is a special one. In the old days, not everyone could afford silver as we know it, and this is when poor man’s silver was created. 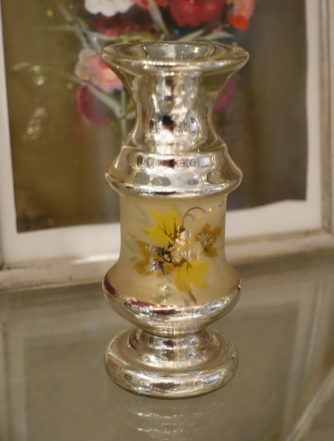 As the name implies, it was for ordinary people as a substitute for genuine silver ware, so they had the possibility of decorating their homes in the ‘same way’ as the upper and middle class. 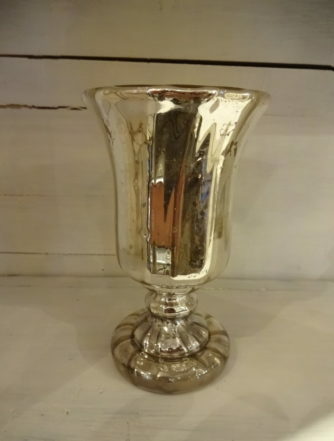 Nowadays, poor man’s silver is a very popular and sought after item in modern interior design. 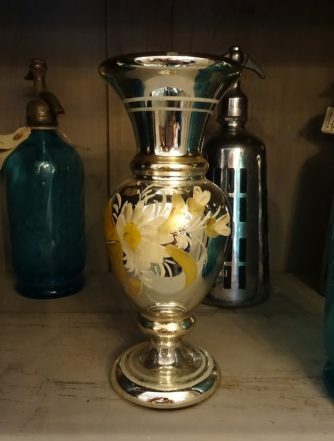 Our own collection includes vintage, French candlesticks and vases. We hope that you enjoy their beauty as we do. 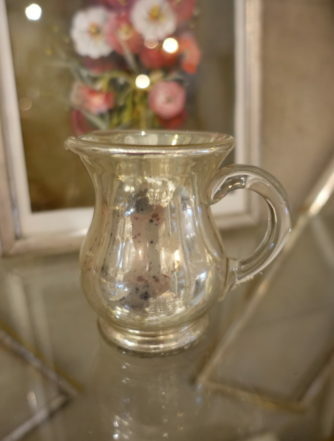 The antique French poor man’s silver is especially known for the washed, worn, delicate look on its elegant shiny exterior. 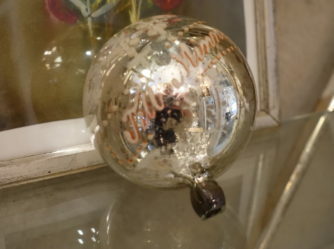 Hidden underneath the layer of mercury is hand blown glass, which reveals the true poor man’s silver, and it is with the worn outer layer that any home gains a vintage and alternative look. 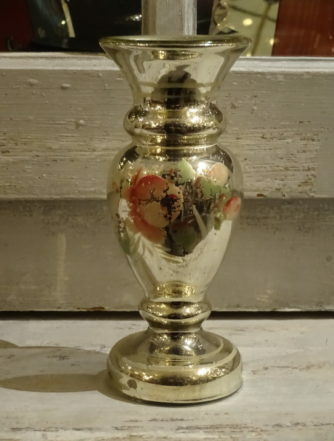 A vintage French poor man’s silver beaker is perfect for a small handful of fresh flowers, and the larger vases are exquisite with more substantial bouquets. 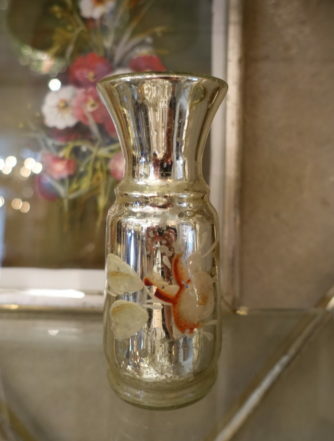 If you love ornate items, we have some decorated with gorgeous floral or fruit designs. 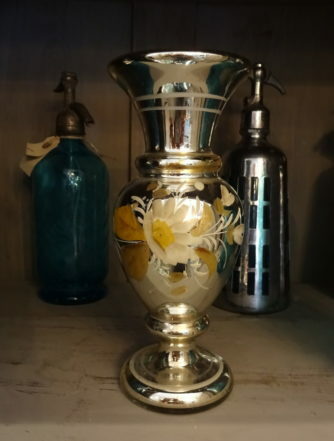 A single poor man’s silver vase is elegant on a chest of drawers, contrasting beautifully with a modern home. 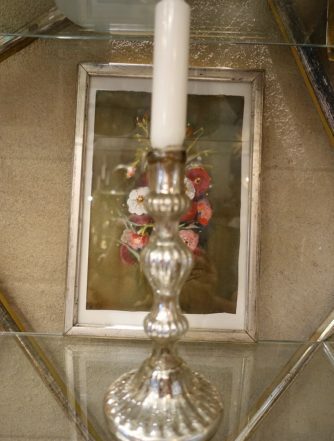 Poor man’s silver candlesticks light a living room from the window sill. 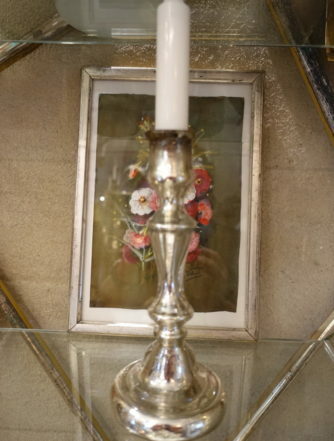 Adding coloured candles can also give a wonderful dimension with their reflected light. The key to true poor man’s silver is their authenticity and patina. 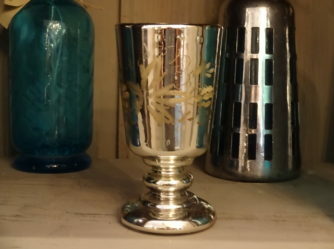 It is signs of age and use on the silver coated glass, which make vintage poor man’s silver so very special. These beautiful and worn items show the tests of time in elegant and rustic ways, so they emanate life, and contribute unsurpassed taste and history.